Grouper is a wonderful lean fish with a firm texture and mild flavor. The salsa and dressing brought out the wonderful flavor of the fish. Champagne mangos have a sweeter flavor and are smaller in size. If you can’t find these, substitute a regular mango. If wanting to add a side dish to complete this entrée, I highly recommend Black Rice with Sautéed Shitake Mushrooms. The colors will be amazing not to mention the flavors. This particular recipe is for 1 adult serving, or an appetizer shared by two. I am using a Lime Avocado Oil and Barrel Aged White Balsamic Vinegar by Spicewood Food Company and can be ordered on-line at Spicewood Food Company. If you have any leftover dressing, try using it in with our salad recipe – Mâche Salad with Roasted Orange Beets, Goat Cheese with a Prickly Pear Dressing . For dressing, place the peeled prickly pear, lime juice, white balsamic vinegar and a sprinkle of kosher salt into a blender. Blend until smooth. Transfer to a small pot over medium high heat. Add the sprig of mint and reduce by half. Strain dressing before serving to remove any seeds and the mint sprig. I strained it directly into a small serving dish. For mango salsa, combine all ingredients and set aside. Rinse and pat grouper dry. Sprinkle one side with a little kosher salt. In a small skillet heat lime infused avocado oil over medium high heat. Place grouper into pan, cover and sear for 4 minutes. Flip, cover and sear for an additional 4 minutes, or until fish begins to separate, and shows its flakiness. 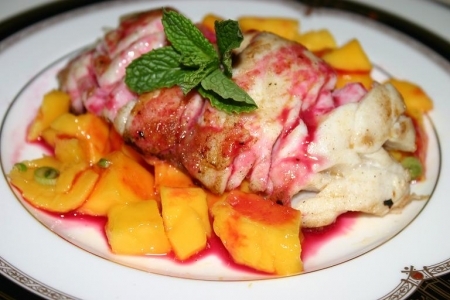 To plate, place all of the mango salsa onto plate, place grouper on top and drizzle with the prickly pear dressing. Garnish with a mint sprig. Try Wente Vineyards Morning Fog Chardonnay (Livermore Valley), Chateau Ste. Michelle® Indian Wells Chardonnay (Columbia Valley, Washington), Villa Maria Unoaked Chardonnay Private Bin (New Zealand), Skinny Dip New Belgium Brewing (Ft. Collins, CO) Samuel Adams® Summer Ale (Boston, MA).